Like many lighting cameramen who do not live within easy striking distance of London or any of the other big towns in UK where the equipment re-sellers lurk, I’ve had to reply on a lot of second hand information from colleagues at the GTC, from fleeting glances at other colleagues’ kit and on Youtube clips to assess the suitability of the Sony PXW-FS7 for my broadcast TV and corporate production work. On the face of it, this camera – which seems to be the camera of choice for many producers at the moment – appears to tick all the boxes. Stunning images, 4k, interchangeable lenses etc etc. There are numerous reviews on the web, some conducted in a studio environment and some ‘on location’ with camera people artfully shooting this and that and then presenting their footage. What is always missing from these reviews is information about how the camera performs when you give the machine an absolute beating. It is for this reason that I am often frustrated by reviews. Take lens reviews for example. It may sound silly, but I take it as read that a professional lens from Canon, Sony, Fujinon or Zeiss (amongst others) will pretty much do what it says on the tin. What I really need to know the answers to are questions such as “will the unit survive a rain shower if I have left my raincover in the car?” or “will it survive if I drop it?”. Over its life, any piece of equipment owned by a professional lighting cameraman is likely to take a bit of a beating. Our new FS7 had one on its first working day out, yesterday on a boat off the coast of Cornwall. 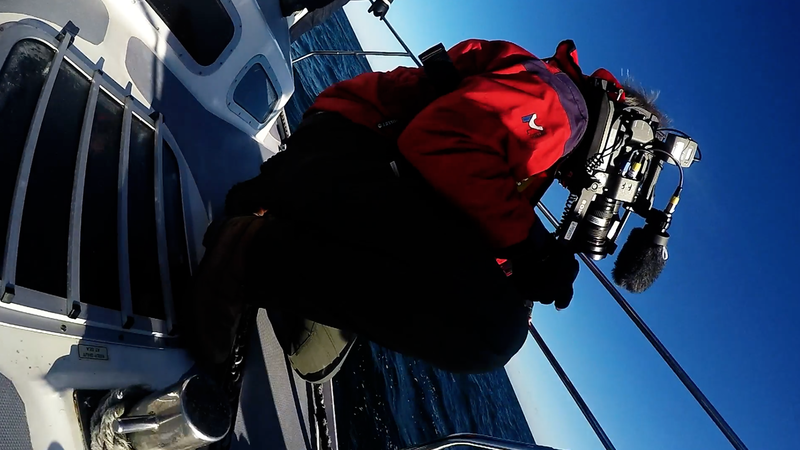 We were out filming with naturalist Nick Baker, looking for whales and dolphins for a film I am making for BBC’s Inside Out. It was a cracking day but the sea was very choppy with a force 5-7 breeze – in short challenging conditions for shooting – I have the battle scars to prove it! Bumps scrapes and bruises all over from smacking it to every hard object on the boat while trying to make TV! The camera performed brilliantly well – taking fantastic images but there is a list of ‘buts’. I was working hand held, mostly on a wide Canon ef 17-40 f4 lens and as I was tossed hither and tither on the boat it was hard not to turn on various buttons on the side panel of the camera with my cheek. The f-stop dial is also in a deeply annoying position – this is of course fixed when you have ‘proper glass’ with the stop on the lens, but when using modern photo lenses this is very annoying. I am sure I will get used to the location of the f-stop wheel and this will come second nature the more I use the camera, but the other issue with these ‘fly by wire’ f-stops on the lens is that ‘bashing the stop’ cannot be done smoothly. This can only be fixed through buying a ‘proper’ telly lens such as the new Zeiss 21-100 f2.9. One worrying issue was the ‘Metabones’ problem. A pod of dolphins showed up at the front of the boat. I had a long lens on the camera at the time, so I quickly changed to a wide, only to find that the Metabons Ultra had not recognised the new lens. I had to power the camera off and back on again to fix the issue and by this time I had missed a few precious moments with the wildlife. Very annoying and another reason to save up for ‘native’ glass that avoids the problem of lens adapters and has a better focal range. The viewfinder performed perfectly. I have already mentioned a fix I blundered across in a previous post, so there is no need to expand on that again, but I would add that while the screen on the finder is very sharp and gives excellent colour rendition the loupe is very flimsy and I had to be very careful that that did not rip off the camera on a couple of occasions. I should also mention that i had to replace the finder lens with a Polaroid +2 close-up lens so that i could focus the loupe properly on the finder screen. An annoying micro-fix to get the finder working well. The extension handle on the FS7 is very handy, but very clunky. Re-positioning the handle is slow and at one point the two screws that hold the extension handle at a particular length came loose, requiring a very quick fix with my Leatherman tool. This a known fault with the camera build and I can see myself reaching for my wallet again for the Shape extension arm solution that so many have decided upon. Knowing that I was likely to get wet at some point during the day I took the precaution of bringing along my Portabrace raincover. But after a few minutes of trialing the raincover on the camera the day before the job, I knew that this would only be deployed in the event of a total deluge. The raincover is nicely made, but it makes operating the camera very hard. This never used to be the case in the old days and indeed a always used to insist on having a Portabrace on the old Beta-sp 400s. These fitted snuggly to the body of the camera. The covers for the FS7 are essentially glorified tents and frankly far from satisfactory when shooting on the hoof. As a consequence, and basing my decision on the design of our charter boat from AK Wildlife Cruises in Falmouth and the evident skill of her skipper Keith and crew Ross, I took a calculated gamble and operated the whole day without the raincover. On a couple of occasions the camera got a light spraying, but nothing more. The camera body itself is very solid, but there are a couple of potential weak spots for water ingress, so I will be avoiding letting it get too wet in the field. On the whole the camera does appear to be reasonably well sealed from the elements, unlike some other recent releases. Operating from the shoulder was made considerably easier with my Camtree shoulder plate. The camera sits on the shoulder really well and it is infinitely preferable to hand held shooting on our old Panasonic HPX250 that has now been pensioned off. The audio pots are a little fiddly and it is annoying not to be able to switch audio input routing with buttons – all this happens on the menu and this can cause delays. The good news it that the camera has a bass cut on the audio to limit wind noise and also Sony’s ‘auto-level’ feature on the FS7 is much better than it was on our old Panasonic. Both of these features are essential when operating without a sound-man as is so often the case these days. I was able to use my brilliant Audio Technica ATR 875r short camera boom mic. This mic gives me consistently excellent audio quality and has impressed my craft editor on every BBC edit. Overall the camera is more that adequate – it is really quite brilliant. I certainly would not advocate dropping it, it is certainly not indestructible. It has some frailties and there are several after-market addons that are essential to improve functionality, but when presented with probably one of the toughest days filming that I have endured in recent years, it was equal to the task. And I am pretty impressed.